This colourful marbled mani I did some weeks ago was so insanely easy, pretty and popular, it seemed a shame not to share my method. Really, though, there’s nothing more complicated here than a simple dotticure sexed up by – wait for this revelation – dipping your dotting tool into TWO different polishes at once. Sounds naughty, looks stupendous – like accidental, intricate marbling you actually intended to create! And if you’ve ever tried to marble anything in nail art, then you know it’s a relentless pain in the arse, so any simplification is more than welcome. First, begin by rounding up your tools. For this manicure, I used just three lacquers, Enchanted Polish’s orchid pink Dope Jam, golden yellow House of the Rising Sun and dusty blue September 2015. Marbled together, these polishes create cool new blended colours – blue and yellow makes green, yellow and pink produces orange, and pink and blue makes purple. So no need to bust out your entire polish collection for this dotticure; just pink, yellow and blue will get the rainbow job done nicely. For this manicure, I used a small dotting tool I’ve had forever and these polish palette rings from Daily Charme I was gifted last Christmas. I particularly like the paw print ring, which is why I’m sporting it in these tutorial pics. It fits securely, but not snugly, and is well balanced so it doesn’t slide to either side of your finger mid-mani. So having assembled your little arsenal, let’s get down to the criminally easy step-by-step. Step 1: Paint your nails to opacity with a basic white creme. Step 2: Once dry, slip on a polish palette ring and fill the tiny divots with your three chosen lacquers. Should you not possess jewelry that doubles as a beauty tool, simply dot your polish out onto whatever surface you typically use as a palette. Step 4: Dot onto your nails. Two or three dots per nail should do it. Step 5: Repeat steps 3 and 4 with the yellow and blue polishes. Step 6: Repeat steps 3 and 4 with the pink and yellow polishes. Step 7: Fill in any blank spots or gaps that are irking you for a more cohesive design. Step 8: Once dry, top with a high gloss, quick dry top coat such as Seche Vite. Then stand out in the sun and admire all your maybe-not-so-hard work! But okay, here goes, a mini tutorial, for what it’s worth. Step 2: Once dry, take a small dotting tool and, using just a pink creme, a pale blue creme and a yellow creme, dip it lightly first into one polish (say, the pink) and then another (this time the blue) and then dot onto your nails in a random fashion. 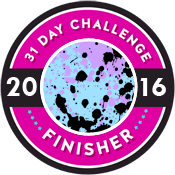 What you’ll be left with is a small marbled dot that’s a little pink, a little blue and a little purple combination of the two. Step 4: Top with a layer of high gloss topcoat such as Seche Vite. Then sit back and marvel at this magnificent mani that took next to no work! Marbles found. Also Irish (or part Irish on my mom’s side) and totally kissable, thanks to this seasonally-hued lime sugar lip scrub I whipped up today. It’s so criminally easy, it feels ridiculous even including a recipe, but a little instruction is always nice. And so here’s how to make your own delicious, four-ingredient lip scrub this St. Patrick’s Day, or any other day of the week. Step 1: Round up your ingredients – white granulated sugar, coconut oil, lime juice and food colouring. Step 2: Gather any utensils you need for mixing – a small bowl, a silicone spatula and a couple of measuring spoons. One (and I do mean one; otherwise, you’ll wind up with neon green lips) drop of lime green food colouring. Step 4: Spoon into a small plastic container with a lid (or small lidded jars if you’re giving them away, as I mostly am) and enjoy! So there you have it, super kissable lips just in time for getting your Irish smooch on this St. Patrick’s Day. Easy, glittery trees, the Finger Candy way! Step 1: (We can have lots of fun!) Paint your nails to opacity with two polishes, a simple dark creme on your middle two fingers (this can be any shade you’d like, although I like the tree detailing as against this basic black) and a festive glitter bomb on your index and pinkie fingers, here KB Shimmer’s sELFie. Once dry, top with a layer of quick dry topcoat. Step 2: (There’s so much we can do! Okay, I’ll stop with the NKOTB jokes now.) Apply striping tape to your two middle fingers in the shape of a wide chevron from the centre of your cuticles down to the edges of your nails. Don’t worry if the small point up at your cuticles doesn’t come together perfectly – you’ll be adding a tiny little star charm at the end that will cover up any boo-boos. Step 3: Fill in the taped-off space on your two middle fingers with a Christmas tree green polish, here Enchanted Polish’s Lost Boy. Depending on the polish you choose for your index and pinkie fingers, you may be able to use it (skipping over step 3 entirely.) But super thick glitter bombs like sELFie can be difficult to wrangle in nail art, and are best used as megawatt accent polishes over a complimentary-hued base. Step 4: Top the now-green trees with two light coats of the glitter polish. Or omit this step altogether because the polish you chose for the trees covered it up just well enough in the first place, thankyouverymuch. Step 5: Once dry, carefully remove the striping tape, pat down any errant bits of glitter with the point of a toothpick and top with another layer of quick dry top coat. Step 6: With the topcoat still tacky, place a star upon the highest bough of each of your trees, here a couple of little golden charms I purchased from Daily Charme. You could also paint on your stars using yellow polish and a small detail brush, or do what I did last year and fish all the golden stars out of another bottle of polish and top your tree designs with those! 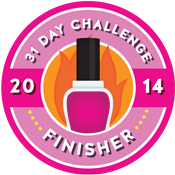 The second-to-last daily theme in the 31 Day Nail Art Challenge (holy cats, we’re almost there!) is a tutorial. 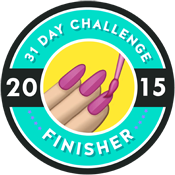 In the three years that I’ve been participating in this challenge, I’ve never fully understood whether the prompt calls for you to follow another nail artist’s tutorial or create one of your own. But seeing as I really don’t do that many tutorials to begin with (pretty well every second one would have to start with “Step 1: Develop an unhealthy obsession with the movie Beetlejuice”) I thought I’d try my hand (and nails) at a little how-to. 2. Lay down three coats of a pale base polish, or however many it takes to reach full opacity. Here I used OPI’s Sailing & Nail-ing, a pale, robin’s egg blue. 3. Once dry, take your brush and gently dip it into the small blob of polish you’ve daubed out onto your artist’s palette. Or, if you’re me, you use the back of an old DVD case. Here I started with the purple holo, A England’s Crown of Thistles. Take a quick peek at the polish on your brush; if it seems like you maybe picked up a bit too much, simply dab it up and down on your palette a few times to remove the excess. Much like salting your food, dry-brushing is one of those areas where it’s better to start small and work your way up; you can always add more, but you can’t subtract. Then, taking your nearly-dry brush, drag it straight down your nails from the cuticles to the tips. Or start in the middle of your nails and drag it downwards. Or start at the top and draw it down only halfway. This manicure is designed to look a lot undone, so there are no precise how-tos. And if you do accidentally stumble into a boo-boo, just remember that layered techniques like this one are super forgiving, and mistakes are easily rectified and covered up. 7. Add the black streaks, using an ultra light touch. Again, you can always add, but you can’t subtract. It’s important to keep that in mind when using black as an accent colour in your nail art. Once dry, it’s time to assess your work. The goal here is not necessarily total coverage – it’s fine if the base polish is still peeking through a bit – but if that’s what you’re going for, repeat steps 3. to 7. as you see fit. Need more purple in that corner? Put more purple in that corner. Whoops, put too much purple in that corner? Cover it up with a bit of silver. In these two photos, you can really see where I added more of everything after layering on my first black bits. 8. Continue the random layering of your polishes until your masterpiece is complete. And if you’re anything like me, you’ll know you’ve reached that perfect level when you proceed to hurtle directly over it, add way too much polish and have to redo one nail entirely from scratch. But once that’s dry, all that’s left to do is to seal in your work with a quick dry topcoat (I always use Seche Vite) and clean up any polish overage. Et voila, dry-brushed nails! Sugar scrubs are typically the secret weapon behind any super soft, sweetly scented hands and feet, but the actual secret behind the secret weapon is that they’re ridiculously easy and inexpensive to make at home, using nothing more than completely edible ingredients mixed together and stuffed into a sealed container. It really doesn’t get any easier than that, with the nice little bonus being total customization; the basic proportions of the sugar “recipe” stay the same, while allowing you lots of wiggle room to scent your sweet concoction exactly as you wish. Heck, you can even tinker with the proportions of the sugar/oil recipe should you prefer a grainier scrub to a more oily one. This is one very forgiving DIY beauty product, so feel free to play around! I typically make my sugar scrubs with white, fine grain sugar, but I thought brown sugar, with its extra hit of rich molasses, would make a nice – and definitely more traditional – base for the pumpkin pie spices. So would you like to make some of your own? Here’s how! In a large mixing bowl, mix together 2 cups of brown sugar, 1/2 a cup of white sugar, 1 teaspoon of cinnamon (or to personal taste, should you prefer your scrub spi-cay), 1 teaspoon of pumpkin pie spice and 1/2 a teaspoon of nutmeg. Add 1/3 a cup of coconut oil and mix well. You want the finished product to look like damp sand. And that’s seriously all there is to it! With all of the other participants in the Fall Fun Series similarly up to their (now well-buffed) elbows in craft projects, there’s lots of that fun DIY spirit kicking around the collective today. Should you wish to check out the projects that are either delighting them or driving them absolutely mad (that’s sort of the nature of homemade craft goods, though, right?) you can find a list of their blogs below. 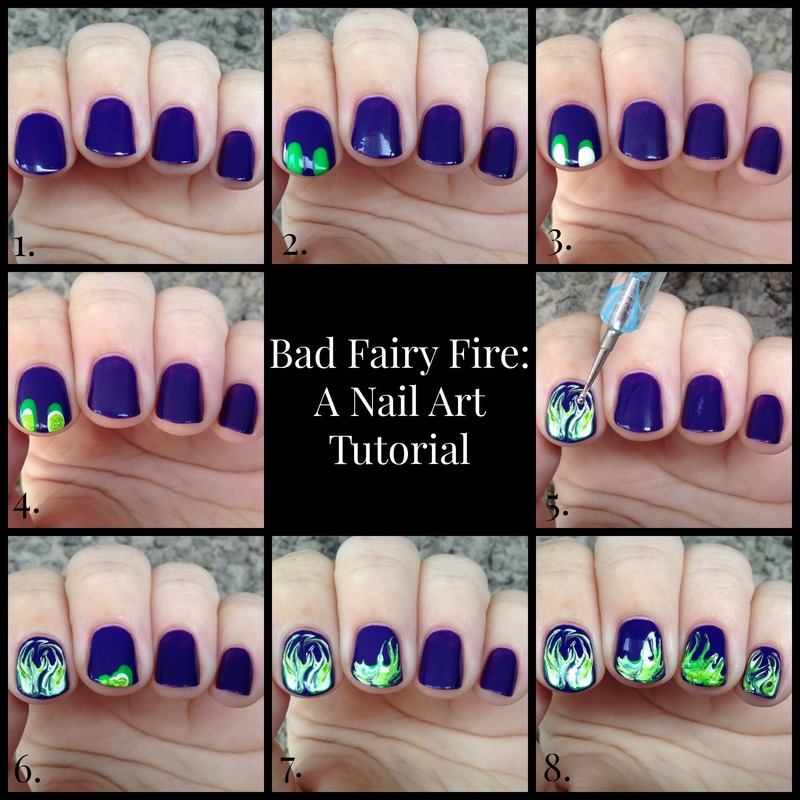 I had a terrific response to these flame-licked nails I posted the other day – really, so many sweet compliments. 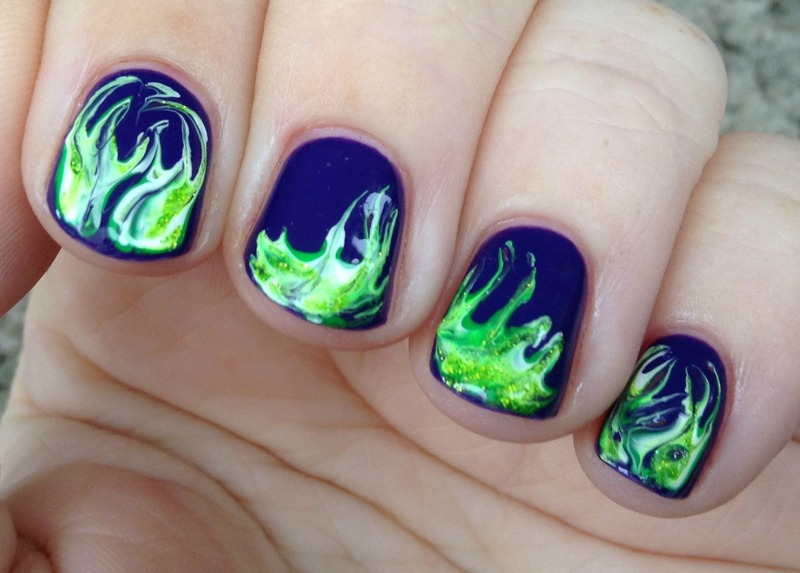 And seeing as they were ultra easy in addition to popular, I thought I’d share the love AND my technique for how to achieve these fiery nails, this time with a Halloween-leaning bent. I suppose this glittery green fire could be Maleficent’s evil-conjuring fire, but really, one green, bad fairy spell is just like the other, is it not? Let’s get into this! 1. To begin, brush on two coats of a dark, opaque polish. For the more traditional fire nails I did the other day, I used a deep, blood red as the background polish. For these more supernaturally-minded nails, I used OPI’s Do You Have This Color in Stock-holm?, a dark, royal purple. 2.-4. Working quickly and going one nail at a time, brush on a thick coat of your base polish. Then, taking the three polishes you’re going to blend together for the fire effect (the other day it was orange, yellow and a glittery red, whereas here it’s Finger Paints’ neon green Silkscreen Green, Smitten Polish’s glittery green Not Your Mama’s Easter Grass and a basic white creme) dab one atop the other, starting with the neon green, then the white, and finally the glittery green, right at the tips of your nails. 6.-8. Continuing to work one nail at a time, repeat with your remaining nails. I varied up the design a bit on my middle and ring fingers, swirling the flames up towards the centre of my hand, but you can make your flames bend and dance however you wish. Not shown: Topcoat application and clean-up, but you already do that always, right? Right! 😉 Then in the final analysis you’re left with something like this. Flame on!